Climate change is expected to alter the geographic distribution and abundance of many species. 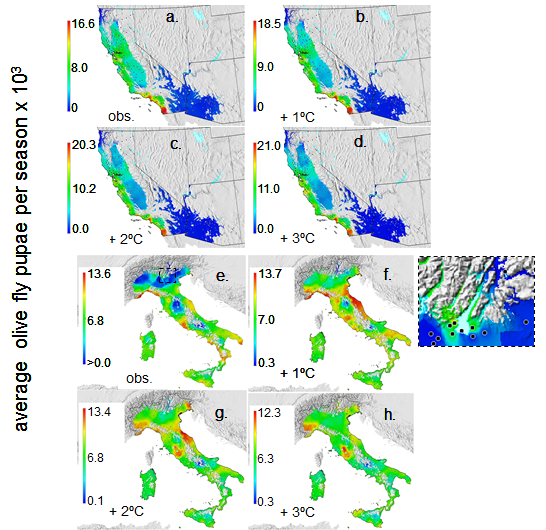 Here we examine the potential effects of climate warming on olive (Olea europaea) and olive fly (Bactrocera oleae) across the ecological zones of Arizona–California (AZ–CA) and Italy. A weather-driven physiologically-based demographicmodel was developed from the extensive literature and used to simulate the phenology, growth and population dynamics of both species. Observed weather for several years from 151 sites in AZ–CA and 84 sites in Italy were used in the study. Three climate-warming scenarios were developed by increasing observed average daily temperature 1◦, 2◦ and 3◦C. Predictions of bloom dates, yield, total fly pupae and percent infestation were mapped using GRASS GIS. Linear multiple-regression was used to estimate the effects of weather on yield and fly abundance. Olive has a much wider temperature range of favorability than olive fly. The model predicted the present distributions of both species and gave important insights on the potential effects of climate warming on them. In AZ–CA, climate warming is expected to contract the range of olive in southern desert areas, and expand it northward and along coastal areas. Olive fly is currently limited by high temperature in the southern part of its range and by cold weather in northern areas. Climate warming is expected to increase the range of olive fly northward and in coastal areas, but decrease it in southern areas. In Italy, the range of olive is expected to increase into currently unfavorable cold areas in higher elevations in the Apennine Mountains in central Italy, and in the Po Valley in the north. Climate warming is expected to increase the range of olive fly northward throughout most of Italy. A more detail study was done for the island of Sardinia. 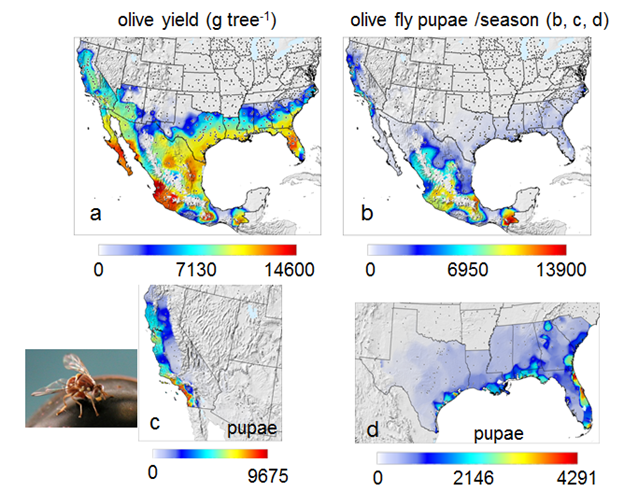 Modeling/GIS analysis of the prospective distribution of (a) olive yield, (b) olive fly pupae per season in North America expanded for (c) California and (d) the SE USA. Gutierrez, Andrew Paul, Luigi Ponti, C. Ken Ellis and Thibaud d’Oultremont (2008) Climate Change Effects on tritrophic systems. Climate Change 87: 167-192. Gutierrez, Andrew Paul, Luigi Pontiand Q. A. Cossu (2009) Prospective comparative analysis of global warming effects on olive and olive fly. (Bactrocera oleae (Gmelin)) in Arizona-California and Italy. Climatic Change 95:195-217. Rochat, J. and A. P. Gutierrez (2001) Weather mediated regulation of olive scale by two parasitoids. J. Anim. Ecol. 70: 476-490. Gutierrez, A.P., M.A. Pizzamiglio (2007) A Regional Analysis of Weather Mediated Competition between a Parasitoid and a Coccinellid Predator of Oleander Scale. Neotropical Entomology 36(1):70-83.